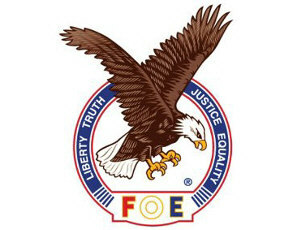 The Fraternal Order of Eagles, An international, non-profit Organization, unites fraternally in the spirit of liberty, truth, justice, and equality, to make Human life more desirable by lessening its ills, and by promoting peace, prosperity, gladness and hope. An international fraternal organization that was founded on February 6, 1898, in Seattle, Washington by a group of six theater owners including John Cort (the first president), brothers John W. and Tim J. Considine, Harry (H.L.) Leavitt (who later joined the Loyal Order of Moose), Mose Goldsmith and Arthur Williams. Originally made up of those engaged in one way or another in the performing arts, the Eagles grew and claimed credit for establishing the Mother's Day holiday in the United States as well as the "impetus for Social Security" in the United States. Come Down and enjoy the pool tables, dart boards, food and drinks from the bar. Sign up for tournaments, there's always something going on! © Copyright Absolute Solutions, Inc.